Jen went out with friends tonight to see The Hunger Games. They caught an early showing but that movie is long enough that it caused me to start off my evening with a hunger game of my own, namely: being hungry. It's not much of a game at all, actually. Since I got home from work at 5:00 AM and took Jen to the train at 9:00 AM I was more than happy to nap and lounge a bit. While she watched The Hunger Games I watched the Redlettermedia Half in the Bag review of the Hunger Games. I feel like I'm all caught up now. 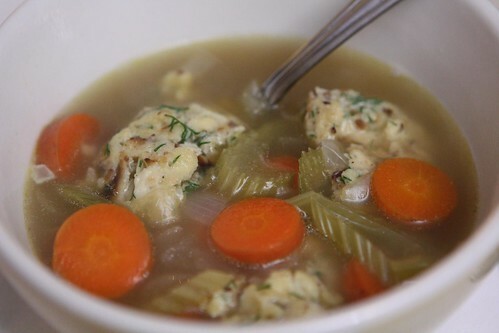 I've never actually made matzoh ball soup so I figured that on this chilly day in early April what could be a better start to our Passover dinner? In 2009 I bought some matzoh ball soup already prepared since I only had 30 minutes to make dinner. Today I had the afternoon to bumble around putting things together. I made the matzoh balls out of crushed matzoh, egg, melted butter, a splash of water, salt, pepper, and fresh dill. I let it rest in the fridge for most of the day then boiled small balls in salted water, finishing them in the simmering broth made out of garlic, onion, carrot, celery, and a little of my homemade chicken stock from the freezer. 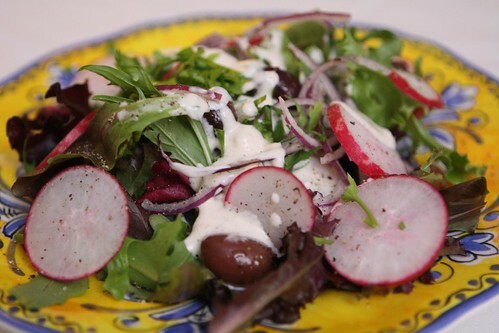 For a second course I made this salad with red onion, kalamata olives, radish, and a creamy ranch dressing with some leftover buttermilk, sour cream, mayonnaise, parsley, paprika, diced onion, garlic powder, salt, and pepper. Sure the buttermilk dressing probably ruins the illusion of this meal being kosher but there are enough things working behind the scenes to make this meal not actually kosher that I figured I would just go for it. I could swear I purchased some smoked salmon for this salad but I tore my fridge apart and it's not in there. I had intended this salad to have some smoked salmon on it but, alas, it was not meant to be. Luckily nothing says Passover like creamy buttermilk ranch dressing! For main courses in the past we've had brisket, salmon, and veal. 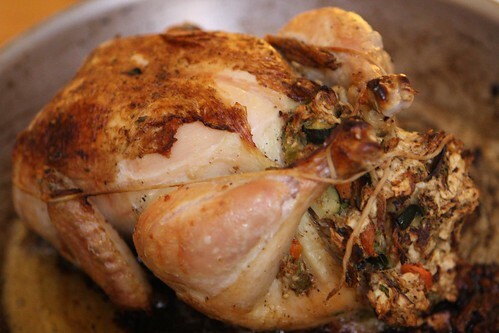 It seems odd that we've never had chicken so I made this roast chicken, very simply, with a matzoh stuffing. I got a chicken from down the street at my local butcher shop. It was labeled as a "Cob Cob Chicken." After returning home to Google I have found nothing to indicate that this is a real breed of chicken. Maybe that particular chicken was just named Cob Cob by the workers there. I made the stuffing with butter, olive oil, garlic, onion, carrot, zucchini, chicken stock, crushed matzoh, egg, salt, and pepper. I made way too much so I ended up stuffing the chicken and also cooking the remainder of the stuffing alongside the chicken in the pan. One thing was certain, this was the most delicious and flavorful chicken either of us had ever eaten. I have no idea what the meaning is behind this "Cob Cob" business but if you find some chicken mysteriously labeled as such at your local butcher buy it immediately. You will not be disappointed. 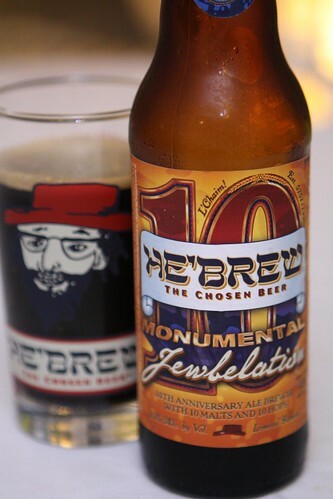 For beer I couldn't think of any better time to enjoy this He'Brew Jewbelation 10 from Shmaltz Brewing Company. This beer is brewed with 10 malts, 10 hops, added 10 times in a 100 minute boil coming in at 10% alcohol. This beer is five years old so I wasn't quite sure what to expect. I'd imagined that the alcohol content was probably a bit over 10% with that amount of time to age. It poured a deep brown with a small tan head and was a very nice, dark, ale. I can see the character it had developed over the past five years versus some of the beers I had this winter which I could tell I was consuming too early, most notably the St. Bernardus Christmas Ale and the Trader Joe's Vintage Ale. They were good but I can see where they would lead to this beer after being properly aged for at least a year or two. 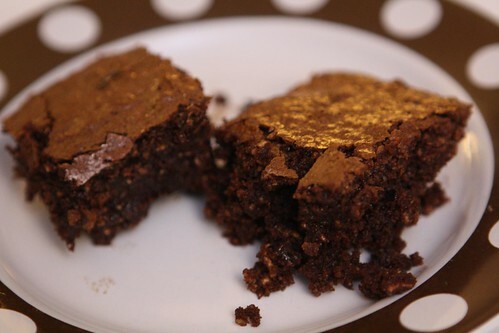 For dessert I made matzoh brownies. I melted some unsweetened chocolate and butter (sorry, folks, margarine is just not part of any meal that I'm ever going to make), then added some eggs. I stirred in some sugar, brandy, salt, and finally some matzoh that I'd crushed coarsely with a mortar and pestle. I baked it in the oven for about 25 minutes and that was about it. I didn't feel they needed to be served with anything else. They came out fudgy and delicious and there was no need to spoil them with any additional ice cream or the like.